"A nice, summery mix of meat and veg that is super easy to grill and eat. The sauce makes it even better!" Mash garlic to a paste with salt using a mortar and pestle or flat side of a large knife, then whisk together with orange juice, lime juice, olive oil, cumin and oregano in a bowl. Preheat an outdoor grill to medium-high heat (375 degrees F to 450 degrees F). Thread beef on 4 skewers, leaving a little space between each piece. Put skewers on a baking sheet and sprinkle all over with salt and pepper. Thread zucchini onto 4 skewers so slices can grill cut sides down, then transfer to baking sheet. 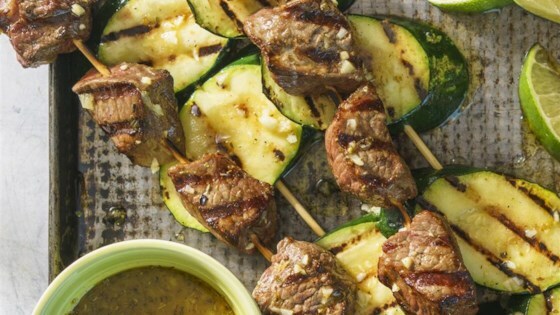 Lightly brush beef and zucchini all over with oil. Lightly oil grate and grill beef, covered with lid, turning once, about 4 minutes total for medium rare. Transfer to a serving platter and cover with foil to keep warm. Lightly oil grate again and grill zucchini, covered with lid, turning once, until grill marks appear and zucchini is just tender, 4 to 5 minutes total. Transfer skewers to a serving platter. Drizzle beef and zucchini with about half of sauce, and serve remaining sauce on the side. I marinated the meat a few hours before I grilled. After supper my family said I should make it again. These were very very good. The sauce is so delicious. But I think the next time I make these I would marinate the meat as I just wished the flavour from the sauce had infused the meat.